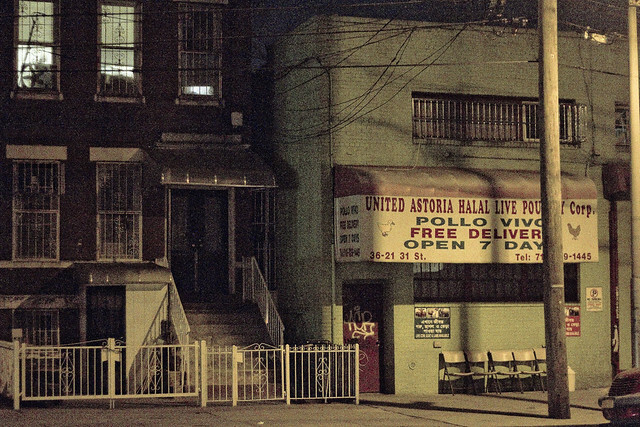 Astoria at night, in today’s post. 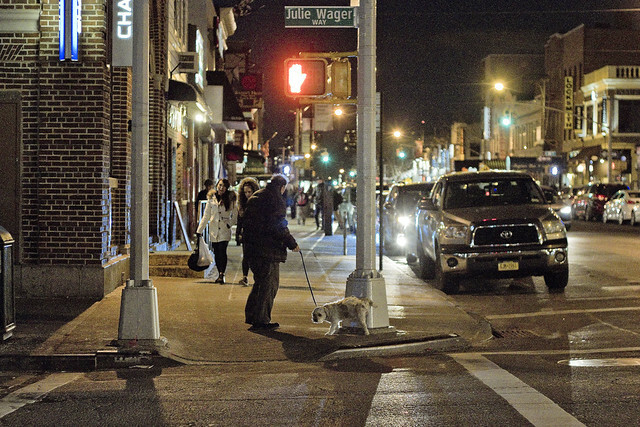 Recent circumstance compelled one to don the 35 pounds of coat and sweater, tie on the recording devices, and perambulate across the cold wastes of Astoria’s southern edge to a meeting in the Dutch Kills neighborhood. As opportunity to crack out photos is severely constrained due to the cold, one got busy with the camera. See that little dog? The “pisher” decorating the street lamp? My dog Zuzu unreasonably hates that dog, and will go batshit insane anytime he appears on one of our nightly scratch and sniff sessions. 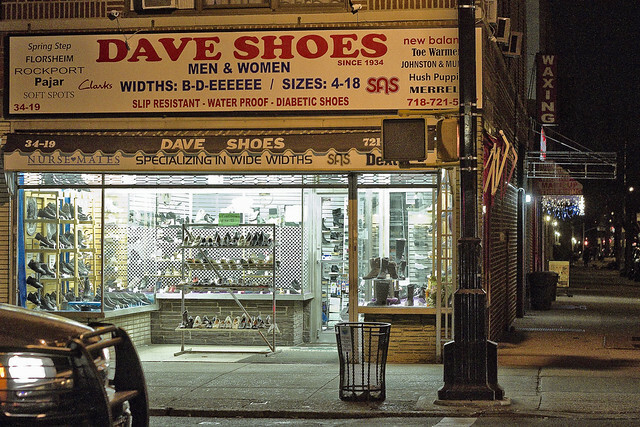 I’ve never shopped at Dave Shoes, but the notion that they advertise for a 6E width shoe is daunting. I checked on what a 6E sized shoe would entail, and from size 6 to 15, it covers a 4 & 1/16 to 5 & 3/16 width foot. I could not find a reference for a size 4 6E, however. 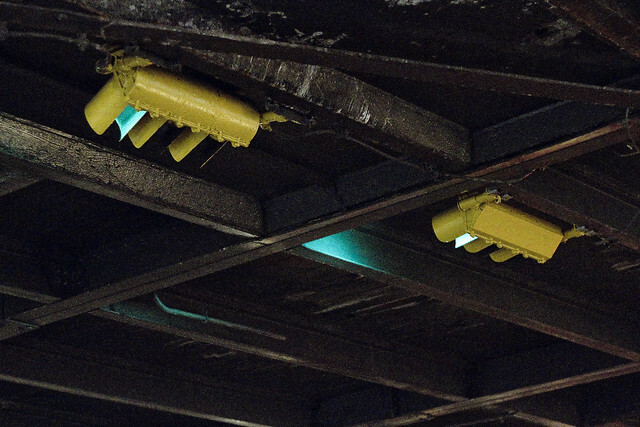 I could have walked a shorter path, going down Northern Boulevard, but I had a little time to kill and I walk that way literally all the time on my way to LIC, so I went the long way – down Broadway and south on 31st street under the elevated tracks of N and Q subway lines. 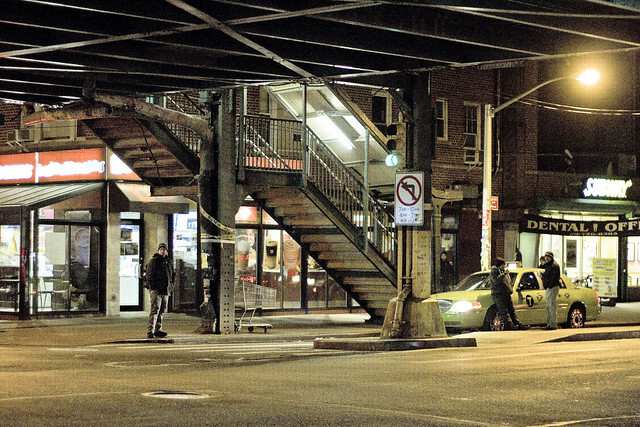 Terror has struck in this part of the neighborhood, as the Governor has recently announced that all of the N and Q stops between 30th avenue and Northern Blvd. will be closed for 18 months in the name of rebuilding them. It’s a good thing, ultimately, modernizing track, signal, and station – but man oh man is this going to be a pain in the neck for anyone who lives or works along this stretch. I’m sure there’ll be some sort of shuttle bus, but… wow… is the R station at 36th street about to get busy or what? Sometime in the near future, I’m going to visit all of these stops and get a proper set of shots “for the record” before they’re all closed and rebuilt. Funny thing is, my understanding of things indicates that there’s a bubble of construction activity about to light off in this area with huge apartment buildings and hotels replacing the older housing stock and warehouses currently observed. This might actually be why the Governor seeks to rehabilitate the stations, in order to handle the load. 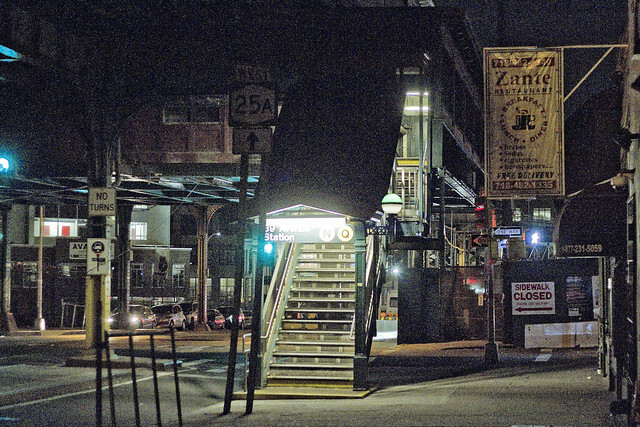 That’s the 36th avenue stop, incidentally, in the shot above. 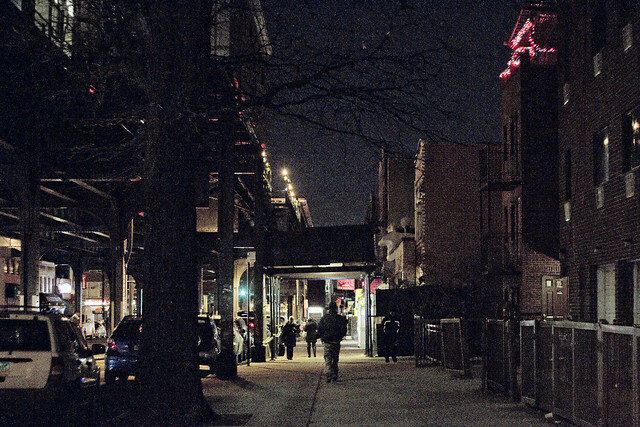 Personally, I wouldn’t want to live here, simply because of the presence of the overhead trains. Also, can’t imagine what it’s like to live next door to a poultry warehouse and abattoir. You can’t pick your family, but you can pick your neighbors. Some of that construction is already underway nearby the 39th avenue stop. A former parking lot and taxi depot has been claimed by the Real Estate Industrial Complex for development, between 39th and Northern and 30th and 31st streets. The property is dead bang center of the swamp which Newtown Creek’s Dutch Kills tributary once fed, and those of you familiar with the area will recall the depression in altitude experienced at this side of the neighborhood. georgetheatheist . . Cut! It's in the can.